A parliamentary report of 1777 recorded local workhouses in operation at Errinden [Erringden] (for up to 20 inmates), Heptonstall (24), Langfield (14), and Stansfield (25). Langfield's workhouse was located at Croft Carr. The presence of a "rope walk" at the east of the building suggests that rope-making provided work for the inmates. Langfield former Croft Carr workhouse from the north-west, 2006. 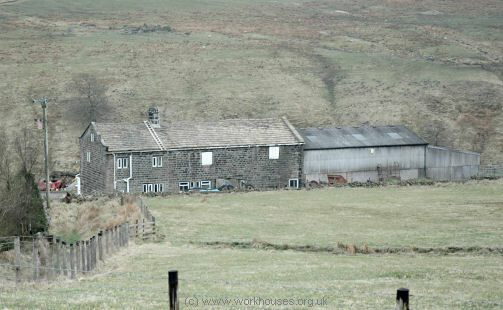 Stansfield's workhouse was at Lane Head, to the east of Blackshaw Head. 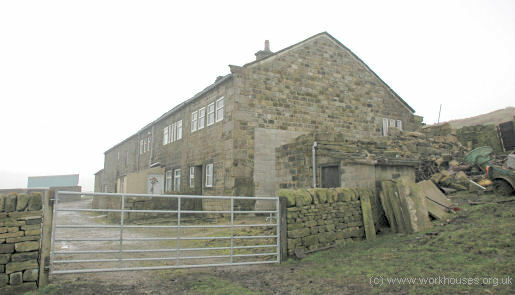 Stansfield's former Blackshaw Head workhouse from the north-east, 2006. Wadsworth operated a workhouse at Spink Hill in what is now a farmhouse. Wadsworth's Spink Hill workhouse from the south-east, 2006. 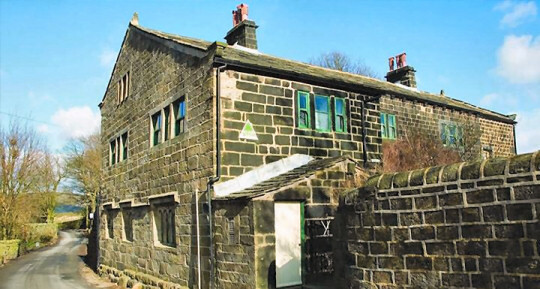 Todmorden and Walsden set up a workhouse alongside the canal at Gauxholme in 1801 in a house rented from John Sutcliffe and John Shackleton for 18 guineas a year. The parish overseers purchased 10 cast iron beds each with a straw mattress, 2 blankets, one sheet, one bolster and one woollen quilt. Todmorden former Gauxholme workhouse, 2006. Heptonstall historian, the late Colin Spencer, researched the Heptonstall workhouse which opened in 1754 on a rented farm on Edge Lane. Heptonstall Edge Lane workhouse from the north-west, 2006. "March 1st Pd. John Pickles and Thomas Whitley for Graveing 5 Daywork: £2-0-0"
Thomas Sunderland was appointed Workhouse Master at £20 a year and supervised the farming and harvesting. The Heptonstall corn was taken down to the mill in Hebden Bridge for drying and grinding. The workhouse had only two spinning wheels and some spindles, suggesting that very little indoor work was expected from the inmates. It was intended to be a self-supporting institution but the income, chiefly from spinning and farm produce, was always well below the expenses which included the heavy burdens of the farm rent and the master's wage. In 1780-81 the total income was just over £16 to set against expenses of nearly £75. In 1781 82 the deficit was £48, and when the cost of the workhouse reached £105 in 1783-84 the principal inhabitants decided that enough was enough. After a town meeting, it was decided that the township's paupers should be "farmed" by a contractor. Ambrose Gill, a weaver, undertook to be responsible for the feeding and clothing of the workhouse inhabitants "at the sum of eight Shillings a Piece each Person for a Calendar Month". By 1800 the total cost of the workhouse was only £6-13-7½ with a few short stays only. 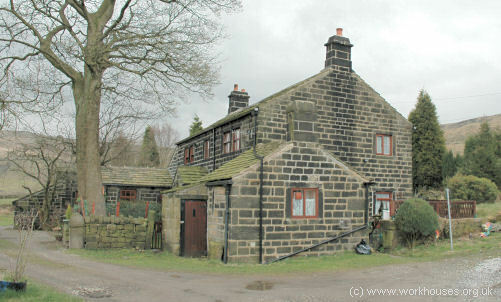 After 1810, the Heptonstall workhouse moved to Popples Bottom, Slack. Erringden 4 inmates: 2 males and 2 females aged from 18 to 65. Heptonstall (temporary workhouse) About 8 inmates. Langfield 8 inmates: 5 males (aged 52, 14, 10, 8, 7) and 3 females (aged 54, 40, 7). Stansfield 15 inmates: 3 males (aged 7, 4, 1) and 12 females (aged 89, 85, 67, 54, 42, 41, 40, 29, 23, 8, 9, 4). County of Lancaster: Todmorden and Walsden (4). County of York - West Riding: Erringden (2), Heptonstall (3), Langfield (2), Stansfield (4), Wadsworth (3). Later Additions (all from 1894): Blackshaw, Hebden Bridge, Mytholmroyd. The population falling within the Union at the 1831 census had been 23,397 with parishes and townships ranging in size from Erringden (population 1,933) to Todmorden (6,054). The Todmorden Union was originally assigned to the county of Lancashire for statistical purposes but from the 1850s was placed in Yorkshire. Todmorden Poor Law Union was the one of the most vehement in its opposition to the 1834 Poor Law Amendment Act. Its member parishes had resisted forming a Poor Law Union but eventually gave way. However, opposition to the building of a new workhouse, led by John Fielden, held firm with a refusal to pay the poor rates. A riot took place with the Chairman of the Board of Guardians being attacked. In 1844 the Union was, exceptionally, given leave to abandon the requirement to provide a workhouse. An 1847 local directory records the union as using three small buildings at Gauxholme, Stansfield and Wadsworth as workhouse accommodation. Finally, in 1876, under continuing threat of the union being dissolved, Todmorden became the last union in England to provide a workhouse when it began to erect one at Lee Bottom near Mankinholes. Ironically, the site on which it was built was on an estate known as Beggarington. The first inmates were admitted at the end of September, 1878, with the first master and matron being Mr and Mrs Gent from Eccles.. The initial capacity of the workhouse was 100 but in 1890 the buildings were expanded to accommodate 250. 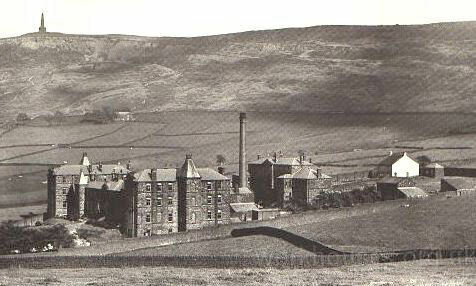 Todmorden workhouse from the west, c.1902. 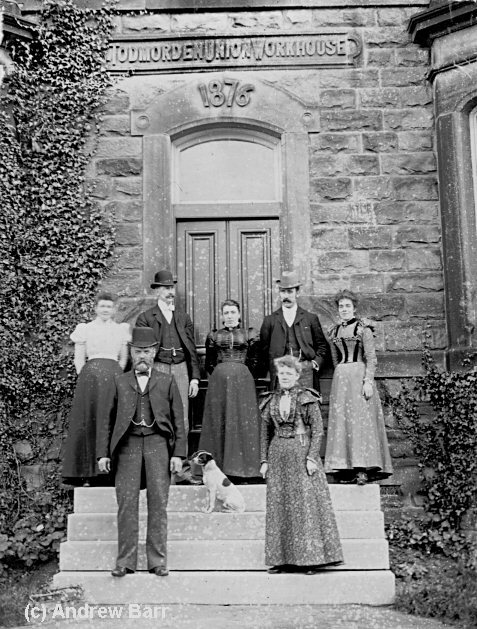 The picture belw, which dates from around 1897, shows the front entrance to the workhouse with the master and matron and what are presumably other workhouse staff. In 1930, the workhouse became a Public Assistance Institution serving the new Calder "Guardian's Area". At that time, it had accommodation for 293, including 69 in the casual wards (60 male places and 9 female). A council architect's report on the buildings noted that they were lighted throughout by gas. The water supply was from a small reservoir in the grounds and was not filtered in any way. Hot water was available in all parts, but only a limited amount of central heating was installed. In the casual ward, there were eight cells for females, twenty cells for males each equipped for corn-grinding work, and a tramp major's room. The institution later became Stansfield View Hospital and after 1948 provided care for the mentally handicapped. The vagrants' wards were closed in 1950. The buildings were demolished in 1996 and the site cleared. 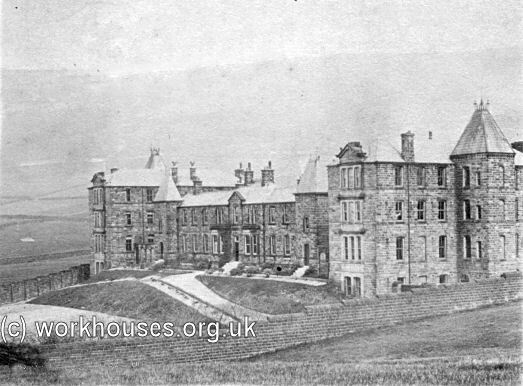 Todmorden workhouse from the west, c.1906. 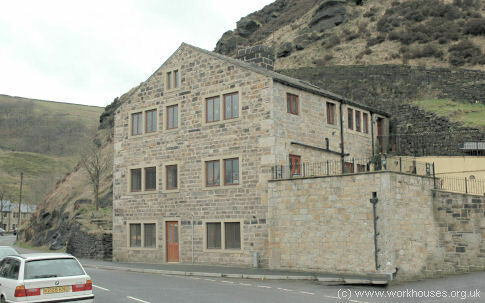 The Todmorden Union operated a children's home at Mankinholes Hall on Mankinholes Bank, now Mankinholes Youth Hostel. The home could accommodate 25 children. Former Todmorden Union children's home, Mankinholes. West Yorkshire Archive Service — Calderdale, Central Library, Northgate House, Northgate, Halifax HX1 1UN. Holdings: Guardians' minutes (1882-1911); Admissions and discharges (1880-82); Letters (1837-41); Workhouse accounts (1875-79). Thanks to Kathy Tomlinson Andrew Barr for help with material for this page, and to Diana Monahan for very kindly contributing Colin Spencer's researches.